Texas lawmakers are offering polarizing statements following President Donald Trump's address to the nation Tuesday night. 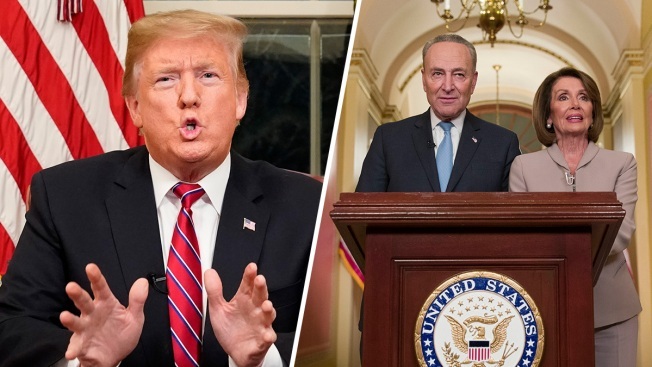 "President Trump is absolutely right that Congress must pass his common sense border security bill and end this very real crisis at our southern border. In Texas, illegal immigration costs state taxpayers billions of dollars every year in health care, education and law enforcement costs. In 2018 alone, over 500,000 illegal aliens were apprehended crossing the border illegally - 300,000 of those were in Texas. "Texans see first-hand the tragedies that take place at our border every day. No one should have to die trying to come to America. I was in Washington today working with the president's team on his historic first address to the nation from the Oval Office and I am committed to doing everything I can to help the president end this crisis. I will be joining him in McAllen on Thursday for a briefing from those working directly on this problem." ". @Potus offered no solutions and no end to a shutdown that he caused, over a border wall we don't need and can't afford. This is not the leadership the American people need. We can open the government tomorrow if the President will just come to the table." "This evening, President Trump reiterated what those of us who travel frequently to the southern border already know: Americans cannot keep our country safe without securing the southern border. The previous Administration clearly failed to fix what President Obama dubbed a humanitarian crisis in 2014. Quite simply, Americans cannot allow the southern border to remain a porous channel for gang violence, crime, drugs, and human trafficking. Although House Democrats have decided that the status quo is acceptable, I'm fighting to make American communities safe again." "Well said by POTUS. Shame on those scoring political points instead of solving problems." "Democrats are sacrificing our security & the security of our allies to try to score political points. Today was a missed opportunity for the Senate to provide critical assistance to Israel & Jordan & to show the Assad regime that it cannot continue to commit crimes w impunity." Check back for updates and additional statements.